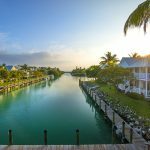 Imagine a vacation place where you can feel at home in the Florida Keys. 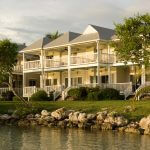 Just heard about Hawks Cay Resort Hotel and compound, a Triple-A four-diamond resort located in the Keys. If you like luxurious surroundings. If your group or family wants tons of activities for every age. If you like the idea of five totally different types of pools. If you crave top-notch hotel food, services and amenities, it sounds like you couldn’t do much better. 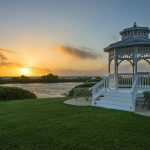 Whether you are a couple looking for a total relaxation experience or a family of 4 generations looking for a place where each member of every generation can have his/her own idea of fun any time they want and then come back together as a family again for chosen times and activities, this place has it all. 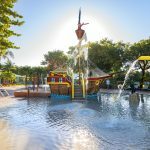 Along with stunning vistas, private lagoons, a pirate-ship swimming pool among other features in Coral Cay kids’ place, and a full-service spa and diving shop. Oh, and they’ve got snuba diving – which means you and your kids (as young as 8) can experience the excitement and joy of deeper-level diving in a sea loaded with coral reefs and astoundingly diverse sea creatures without carrying the traditional heavy air tan on your backs (the tanks float above you on a raft) and without having to pass the sometimes-challenging certification process required for regular scuba diving. Hawks Cay draws visitors from all over the world (their biggest international clientele comes from Canada). The resort works with the local Turtle Rescue to help sea turtles who’ve been wounded (sometimes by man-made things like boat propellers) rehabilitate themselves and get back out to sea where they belong. Visit the Turtle Rescue while you’re here and see one up close. Hawks Cay underwent a multi-million-dollar renovation in 2008, and now with new owners, has just completed another extensive upgrade with plans for more. The place is gorgeous, with matchless views of the ocean on all sides. It sits at mile marker 61 in Duck Key on that long road from mainland Florida out to all the Keys. At Hawks Cay there’s no need to be athletic – relaxation is the biggest goal of many guests of all ages. Make yourself at home in one of 177 guestrooms in the main section, or one of 2f50 two-, three- and four-bedroom suites, all within walking distance of Coral Cay (the kids’ place). Or get moving with volleyball, camp morning/afternoon, all-day sessions for kids in the Pirate Ship swimming pool area, all included in the $39/day resort fee. Family accommodations are readily available as well as lots of adult suites. Sixteen four-bedroom units to group families together. Because there are very few natural beaches in the Keys, Hawks Cay has sculpted the area and shipped in fine sand. Blue is the fishing boat service. Lagoon for kids to experience snorkeling, paddle boarding, and kayaking. Hawks Cay’s 5 pools include the main, the Tranquility pool, the family pool, the Sunset Village (spectacular sunset views! ), and the Pirate Ship pool. Flying from Chicgo to either Miami or Ft. Lauderdale (easier to get in and out of), it takes your jet airplane about an hour and a half. Or if you’re up for true luxury, you can get private flights into Key West or Marathon and then you’re only 15 minutes from Hawks Cay. If you’re up for luxury, you won’t be disappointed. Yes, despite dealing with increased (some more, some less) physical issues, people tend as they age to feel better about themselves and their lives. Like good wine and cheese that get better with time, human beings can improve with aging. More than 1000 senior adults, chosen randomly and across ethnic variations (not volunteers who might have self-selected as people doing well) reported themselves “happier and more content with their lives than those in their 20s and 30s, despite their physical ailments,” according to a study published in the August issue of the Journal of Clinical Psychiatry. 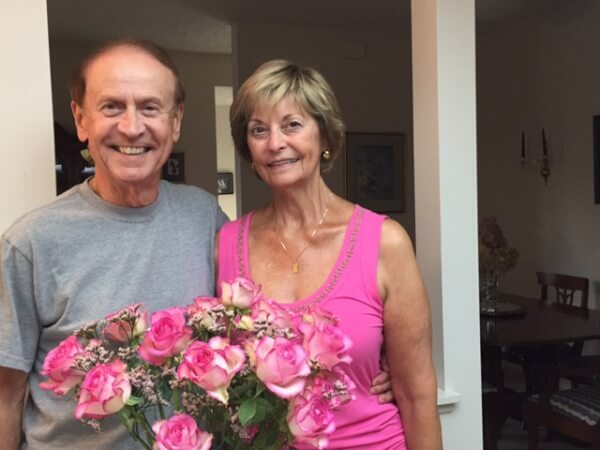 Most seniors have accumulated some level of wisdom, don’t feel they have to prove much of anything any more, and don’t often face as many life-changing decisions as younger adults. Remember how exhausting it was trying to figure out how to handle various situations – at work, in your family life, in your marriage/romantic relationship? Of course, the results of these questions might be different for seniors who are yet struggling to pay the bills in their later years. But for many, simply not having to keep up with a job or career – or keeping up with a much-loved career but feeling more secure in it – can feel liberating and relaxing. Always nice to hear about the benefits of getting older. Read more in the article on Medscape. Thank you, Timeout Chicago, for sharing this important information about such a deal on Uber travel good for rides generally in the 312 area code. If you want to travel in Chicago in a square bounded by south of Irving Park, north of 71st Street and east of Western Avenue, you’ll automatically get the $3.12 fares through Friday at 10pm. If you’ve been hesitant to try Uber, it’s time to jump in and give ’em a try. Around here, we use Uber regularly and have had mainly very positive experiences – on the whole better than some taxi rides. With this kind of deal in this heat. why resist? P.S. Tried it today, Thursday August 18. Worked fine. $3.12 for the ride but it was only available for UberPool at 6 pm. Turned out fine because another person was going in the same direction at the same time, so there was no wait. Summers in Chicago can be brutal. When temps reach 90-ish and humidity gets over 60%, we’re talking grim. Seniors and anybody with heart or lung conditions has to either stay inside or get door-to-air-conditioned-door service. Combine all ingredients in a blender. Blend well. Chill. Before serving, garnish each bowl with a sprig of fresh basil. Nutrition Information (per serving): 35 calories, 0g fat, 0g saturated fat, 0mg cholesterol, 1g protein, 2g fiber, 15mg sodium. Remove bananas from freezer and let sit for 5 minutes (until they begin to defrost around the edges). Place ricotta cheese in a food processor and pulse. Chop the bananas and add to the food processor along with all remaining ingredients. Scoop mixture into a plastic bowl and cover with food-grade plastic wrap, making sure the plastic wrap touches the top of the mixture. Place in the freezer for 15 to 20 minutes. Speaking of New Zealand, as we were in the last post, here’s some cool news about Disney’s classic family film Pete’s Dragon. They’ve re-filmed it with spectacular, real-life locations in New Zealand serving as a backdrop. The film was shot over both of New Zealand’s main islands, the North and the South, showcasing the country’s diverse landscapes. Tapanui (South Island): This small town with a population of 900 was transformed into the Millhaven, a small logging town in America’s Pacific Northwest, for Disney’s Pete’s Dragon. Tapanui is renowned for its incredible fishing in rivers brimming with brown trout and salmon. The Pomahaka River offers world class fishing with some of the biggest brown trout to be found anywhere in the world. If fishing isn’t your thing, grab a bike and jump on the Clutha Gold Trail, one of the New Zealand Cycle Trail’s Great Rides. The trail is 45 miles long and follows one of the country’s longest rivers through a landscape rich with goldminers’ tales of bust and boom. Discover how you can create your own Disney’s Pete’s Dragon itinerary through New Zealand by visiting http://www.newzealand.com/us/feature/petes-dragon/.